June Constantine, Nursing Sister at the General Hospital, has been awarded Accreditation as an Assistant Practitioner by the Society of Radiographers. June began her work in radiography in 2005, under the direction of local Nurses Rodney Benjamin and Brian Bennett, where she assisted in the positioning of patients for X-rays. 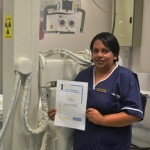 June continued her training under visiting Radiographers and in 2012 Rachel Cornall – the current Radiographer on St Helena – began the process of enrolling June in the Society of Radiographers and supported her with both theory and practical teaching. As a result of June’s accreditation, she will now be capable of conducting axial and appendicular skeleton X-rays independently, for patients over 16 years of age. “June has put an incredible amount of work into her studies. I am very proud that she has achieved this. The syllabus, which is based on UK university assistant practitioner courses, over the last three years has required June to study radiation awareness, ionizing radiation legislation, physics, anatomy and physiology, electronics, health & safety, patient care and the theory behind positioning and radio graphic techniques.